I started my educational journey as a First grade teacher assistant at Linwood Elementary in 1998. Wanting to cultivate a greater passion for education, I pursued and obtained an Associate's Degree in Elementary Education from Holmes Community College in 2000. I recieved my Bachalor's degree from Mississippi College in ( August) 2006, and I began teaching fourth grade at BGS. Believing in my heart that professional educators become life-long learners, I accepted an invitation to Mississippi State University to particpate in a summer long professional development Institute in writing focus. After completing Mississippi Writing Thinking Institute, I developed a broader belief that overall success is created through establishing strong connecting relationships not just with students but with collegues, families, and communities. In 2010, I served as a literacy coach for 3 years, and I absolutely loved serving in this capacity. 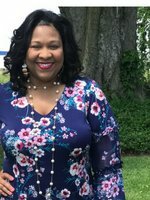 Serving as a literacy coach ignited another fire, and I began pursuing my Specialist degree in Educational Leadership and Adminstration at Mississippi College. I aquired my Administration and Leadership degree in 2015, and I have served as the Lead teacher at BGS for 2 years. I am so very blessed to be able to support some of the most amazing teachers of our "TRUEBLUE" team! I am a Yazoo County resident. I can proudly say that after being apart of a military family for over 15 years! I have been married to John Scott Jr. for 19 years. We have three beautiful children; Madison, John III, and Brianna. I am an active member of the St. Matthew Church in Yazoo City, MS. I serve as a member of the choir and an active youth leader. In my spare time, I love spending time with my family, shopping, and traveling. My teaching philosophy is very simple. Students do not care about how much you know until they know how much you care. Relationships come first. Afterwards, students open up their hearts and minds and then do they become teachable.